03/14/15 – CYBERTRON: Kigurumi / Pajama Party w/Interface Playing live! DJ Xris SMack! Cyber BDay! CYBERTRON: Kigurumi / Pajama Party w/Interface Playing live! DJ Xris SMack! Cyber BDay! DJ Xris SMack! 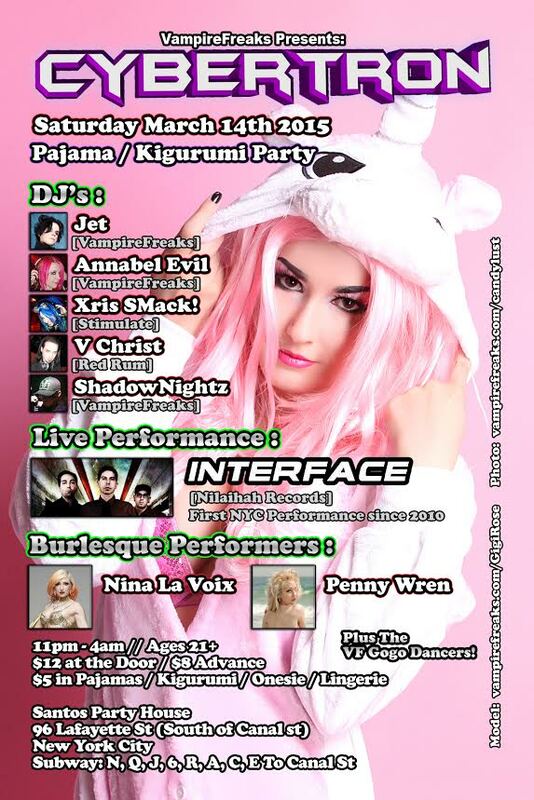 at CYBERTRON: Kigurumi / Pajama Party w/Interface Playing live! DJ Xris SMack! Cyber BDay! CYBERTRON is back in March and we'll be kicking it kigu style with nothing but the best DJ's, exotic burlesque performances, first live set since 2010 by Interface and of course the lovely and lustrous VF dancers. Don't miss out on this edition where you can drink, dance and party hard in the comfort of your own pajama's! Nina La Voix & Penny Wren! ** In addition to all these great attractions, at some point during the night, we will play a song, it will be a song that stands out, you will know this song is different from all the rest. When you hear this song, your job is to go nuts. The guest that sings the loudest and dances with the most energy to this song will receive 5 drinks courtesy of all of us from VampireFreaks! So be sure to listen for it! Take N, R, Q, 6, J or Z to Canal St. then walk to venue. Clothing, Accessories, Footwear, Toys and Much More!